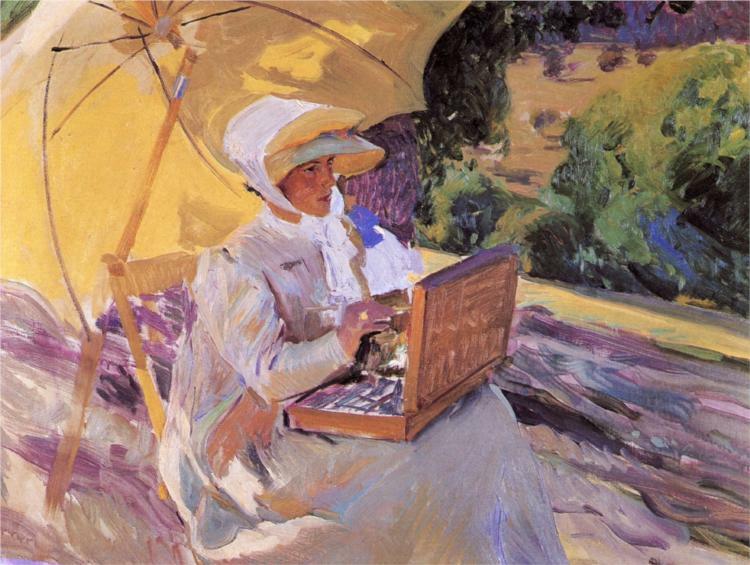 By 1885, Joaquín Sorolla had settled down to life in Rome but during that year he also spent the spring and summer in Paris. At this time in the French capital, the Impressionists were in the ascendancy after they and their art had been criticised and they had had to survive an initial period of ridicule, commercial failure and outright denunciation. 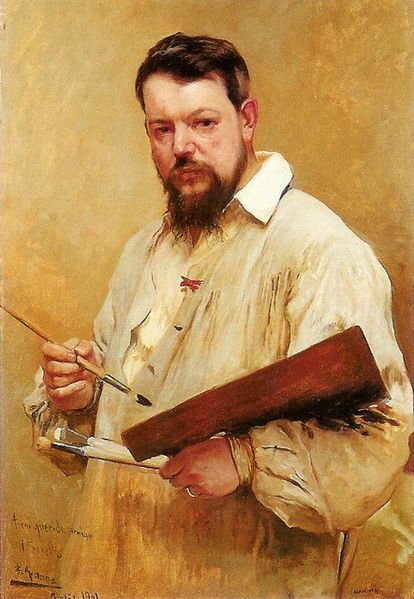 However, the Impressionists had now managed to establish their status some eleven years after they held their first Impressionist exhibition at Nadar’s studios and whilst Sorolla was in Paris he saw much of thire work but it was not the Impressionist painters who would influence him. Whilst in the French capital he visited the retrospective exhibitions of two non-Impressionist painters, the French Naturalist painter, Jules Bastien-Lepage, who had died the previous year, and Adolf von Menzel the German painter who, along with Caspar Davisd Friedrich, was considered one of the two most prominent German artists of the 19th century and was also the most successful artist of his era in Germany. 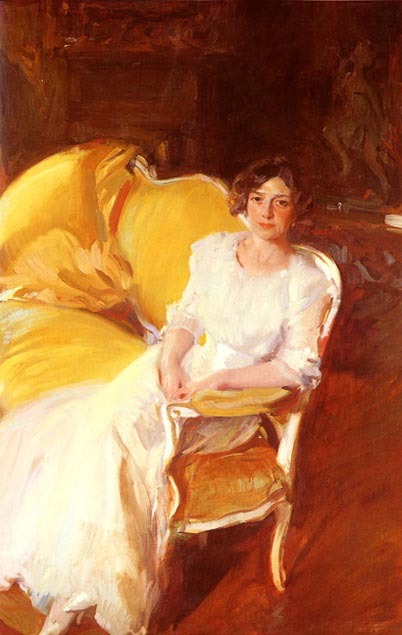 Sorolla returned to his home town of Valencia on two occasions during the late 1880’s and on the second visit in 1888 he proposed to and married Clotilde Garcia del Castillo the daughter of his mentor, the photographer Antonio Garcia. Joaquín and Clotilda had first met in 1879 when he had started work in her father’s workshop. 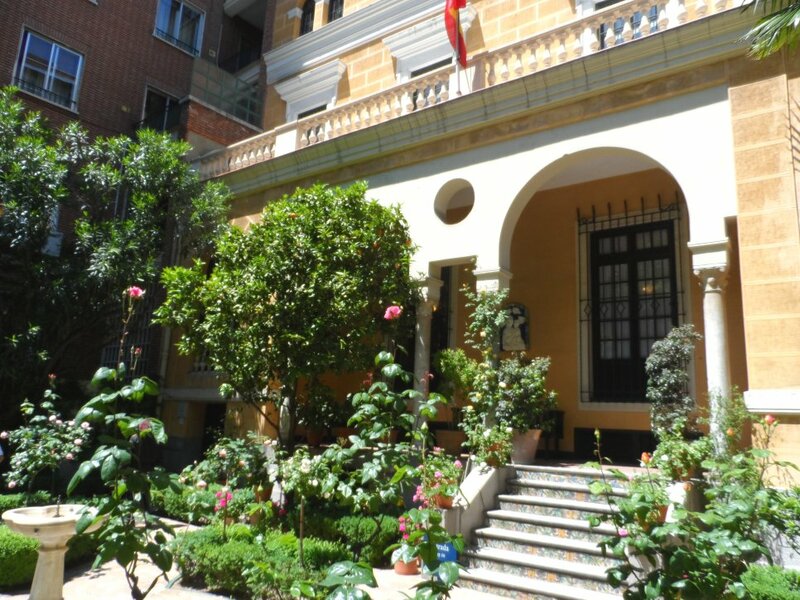 Joaquín finally returned from Italy and in 1890 the couple settled in Madrid. 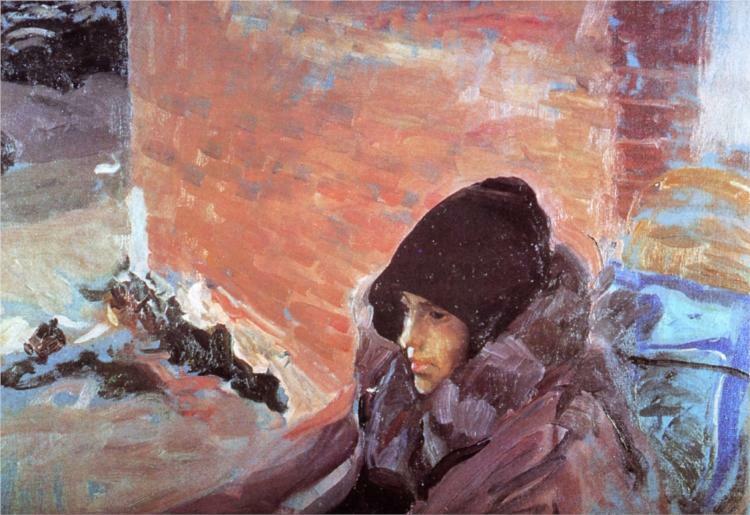 Sorolla style of painting became more individualistic with him tending towards social realism works. For a good example of a social realism work by Sorolla one only has to look at his beautifully executed painting entitled Another Margarita which he completed in 1892. 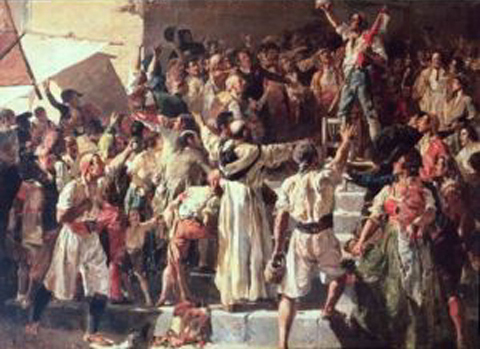 He exhibited the work at the Madrid National Exhibition that year and was awarded a first-class medal. 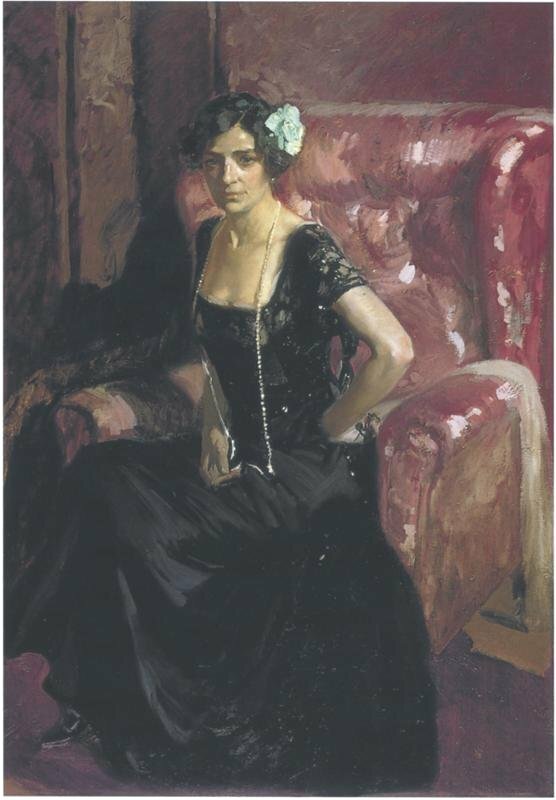 This was also Sorolla first major painting to be exhibited in America and it was awarded the first prize at the Chicago International Exhibition, where it was acquired and subsequently donated to the Washington University Museum in St Louis. 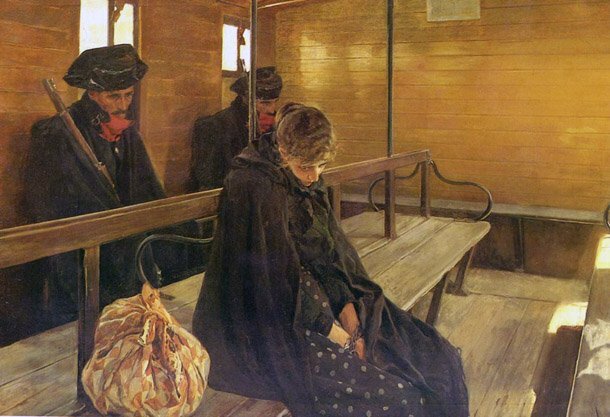 The story behind the depiction is of a woman who has been arrested for suffocating her small son and Sorolla actually witnessed the woman being transported to jail. There is an air of gloom about the manacled woman as she sits slumped on the wooden bench of the train carriage being watched by her two guards who sit behind her. In contrast to the dark and depressing depiction of the three individuals, the carriage itself is lit up by the warm light which streams through the windows at the rear of the compartment and which bathes the entire space. His realist art also embraced what the Spanish termed costumbrismo, which was the pictorial interpretation of local everyday life, mannerisms, and customs. This kind of art depicted particular times and places, rather than of humanity in an abstract form. In many instances costumbrismo was often satirical and often moralizing, but it was careful not to offer or even imply any particular analysis of the society it depicted, unlike proper realism art. In less satirical works costumbrismo took on a romantic folklore flavour. 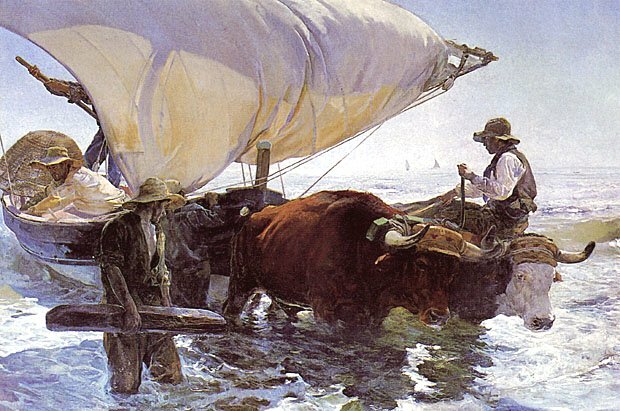 A fine example of this type of work was a painting entitled The Return of the Catch which Sorolla completed in 1894 and which received critical acclaim when it was shown at the 1895 Paris Salon. It was subsequently acquired by the Musée du Luxembourg. He painted a number of similar pictures depicting Valencian fisherman at work bathed in the dazzling Mediterranean light such as his 1894 painting entitled Return from Fishing and his 1903 painting, Afternoon Sun. 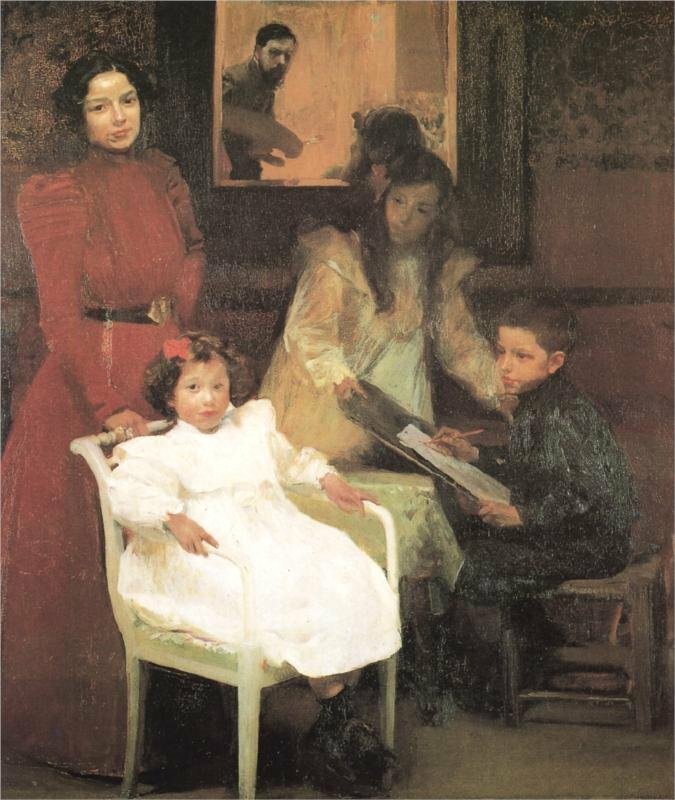 By 1895 Joaquín and Clotilda had three children. Their daughter Maria was born in 1890, their son Joaquín in 1892 and their youngest child Elena in 1895. 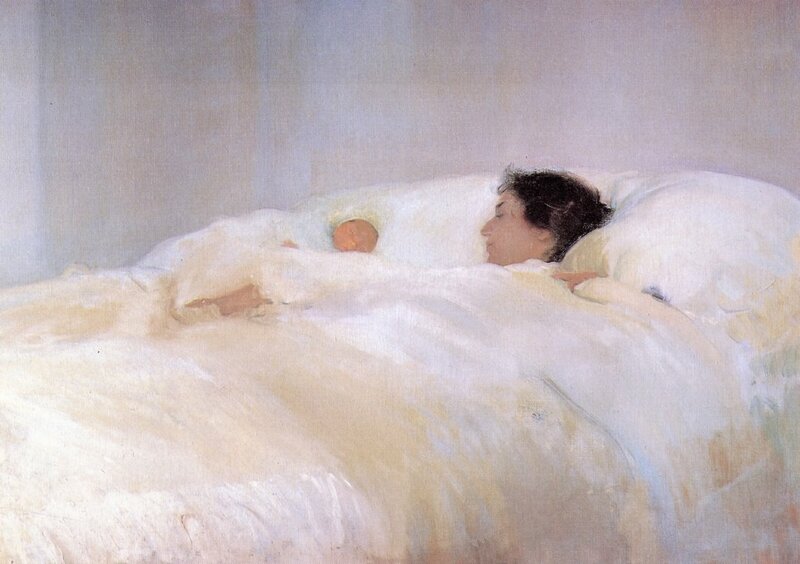 In 1899 Sorolla painted what was to become his most famous and most moving picture. It was entitled Sad Inheritance and I talked about this work in My Daily Art Display of Jan 31st 2011. 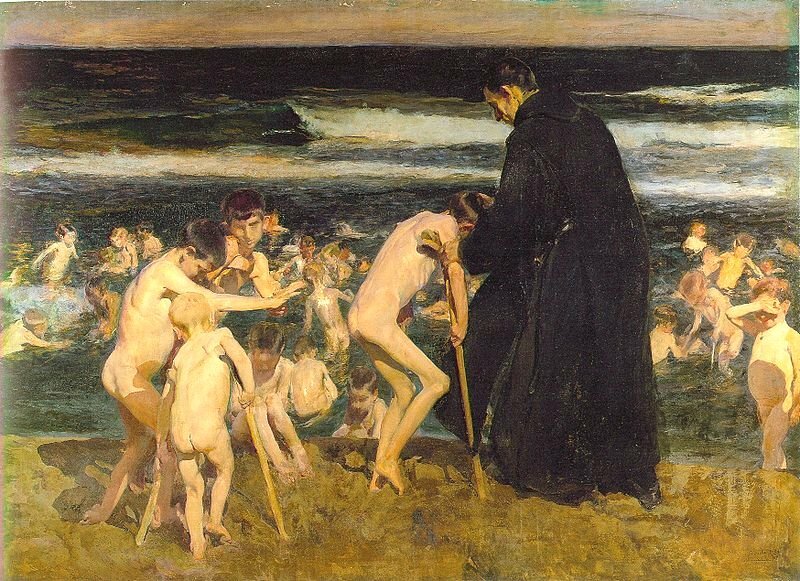 It is a poignant work featuring a monk and a group of children, crippled by polio, who are seen bathing in the sea at Valencia. Sorolla received his greatest official recognition for this work of art, the Grand Prix and a medal of honour at the Universal Exhibition in Paris in 1900, and a year later he received the medal of honour at the National Exhibition in Madrid in 1901. 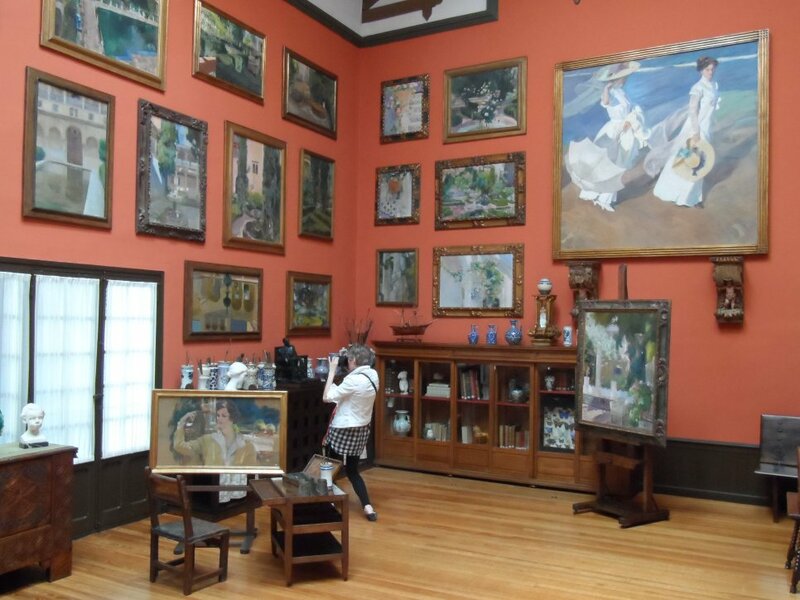 In my third and final blog about Joaquín Sorolla I will feature some of his family portraits, look at the Sorolla Museum in Madrid and conclude the life story of this wonderful Spanish artist. 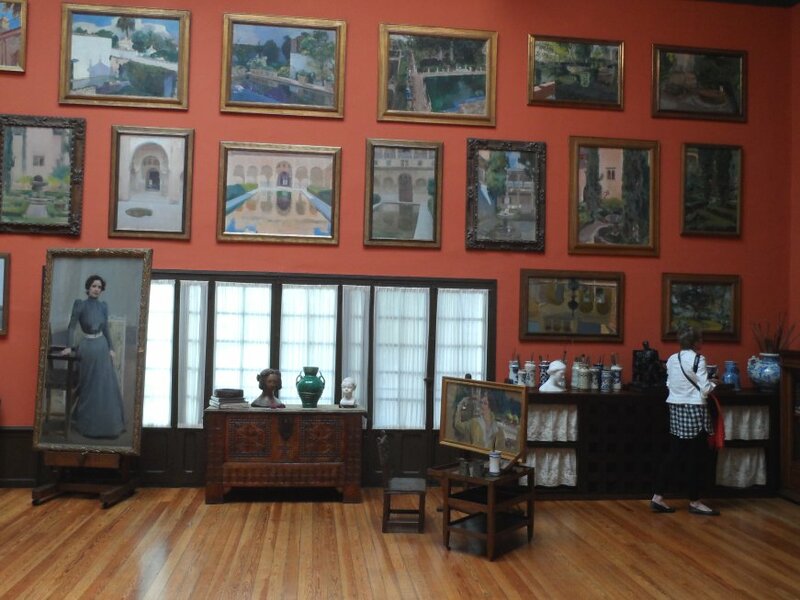 I have said on a number of occasions that when one is in a large city which has one or maybe two famous large art museums, and when one is time-limited, one should search around and look for a smaller gallery which may have hidden treasures to offer. The art on display in smaller museums can be taken in on one visit and there is no feeling of having to rush from room to room, constantly looking at ones watch to try and see as much as one can and ultimately seeing very little. Madrid is famous for its three large art museums the Prado, the Thyssen-Bornemisza and the Queen Sophie but once again thanks to my daughter, who was my travelling companion on this trip, I discovered a pure gem of a museum – The Sorolla, which was just a few stops on the Metro from the city centre. 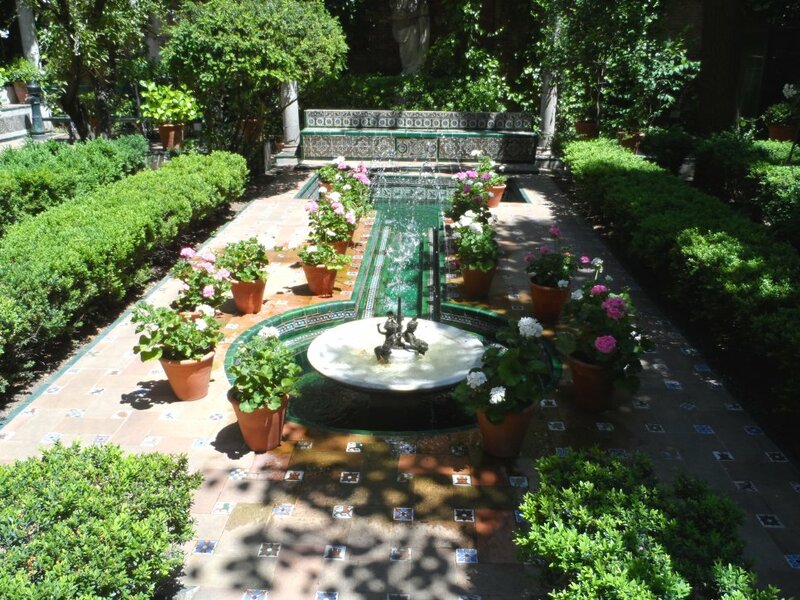 In my blogs I want to offer you a taste of what you would get if you visit the museum dedicated to one of Spain’s best loved artists, show you some of the Spanish painters work and look at his life story. 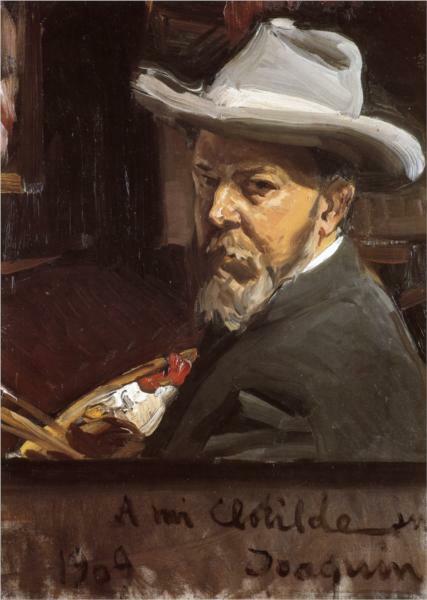 Joaquín Sorolla y Bastida was born into a humble household in Valencia in February 1863. 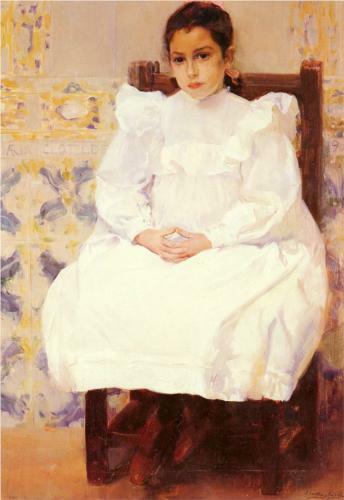 His parents were Joaquín Sorolla Gascón and Concepción Bastida who were retailers. Joaquín and his younger sister Concha were orphaned in 1865 when both their parents died from the cholera epidemic which had swept through and ravaged the Spanish city. Joaquín and Concha went to live with their maternal aunt, Isabel Bastida and her husband José Piqueres, a locksmith by trade. Joaquín’s early schooling was not a success with the young boy being inattentive during lessons and was happy to doodle and draw in his exercise books to pass the time away. His lack of progress at the school came to the attention of his uncle who withdrew him and took him on as an apprentice at his workshop. However, owing to his love of drawing, when Joaquín was fourteen years old, his uncle arranged for him to attend drawing classes in the evening at the city’s Escuelade Artesanos where his artistic ability astounded his teachers, including the sculptor Cayetano Capuz. The following year, 1878, he enrolled on a three-year course at Valencia’s prestigious Escuela de Bellas Artes de San Carlos. It was whilst attending the art school that he met and became friends with a fellow student, Juan Antonio Perez. He was soon introduced to Juan’s family. Juan’s father, Antonio Garcia Perez was a photographer and was very impressed with Sorolla’s art work, so much so that he gave him a job at his photography studio as an illuminator. This opportunity allowed Sorolla to leave his uncle’s workshop and concentrate on his artwork and discover the world of photography. He learnt all about the framing of a subject and the manipulation of light which would prove a boon to him when he started to paint seaside and beach scenes. This “new world” of photography fascinated many artists of the time and the likes of the French pair of Impressionists, Degas and Caillebotte were accomplished amateur photographers. 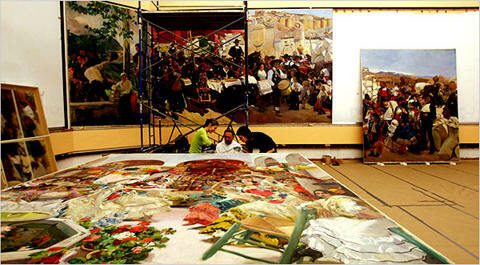 Sorolla painted the picture in the bullring of Valencia which he transformed into a huge studio and which was bathed in brilliant sunlight. The stage-managed scene was a triumph and the Valencia Provincial Council awarded him a three-year scholarship to study art at the Spanish Academy in Rome. One of the conditions attached to the scholarship was that he regularly sent back work to the Council to prove that he was making good use of his time. 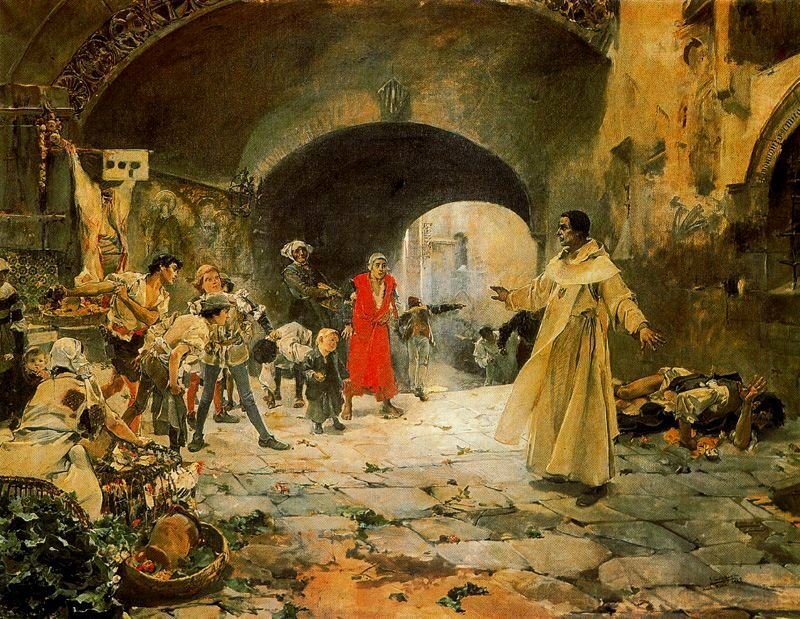 One of the paintings he duly sent back to Valencia was his 1887 work entitled Father Jofré Protecting a Madman. This historical painting was based on the story of Father Joan-Gilabert Jofré, a friar of the Valencian Mercedarian Order, who, on February 24, 1409, was on his way from the convent of the Plaza de la Merced to the Cathedral of Valencia. On his way there he passed along the street of Martín Mengod, the ancient street of the silver workers, next to the church of Santa Catalina. On entering the street he was greeted with a great commotion. Before him, he saw a group of children who were hitting and making fun of a mentally ill man who lay on the ground before them. In those days it was believed by many that somebody who was mentally ill was possessed by the devil. Father Jofré immediately berated the children and took the helpless man with him to the convent of the Order of Mercy, where he was given shelter and cure for his wounds. Father Jofré would go on to found the world’s first lunatic asylum. After his three year scholarship came to an end, Joaquín Sorolla continued to live in Rome and for a time in Assisi but on two occasions between 1885 and 1889 he returns to his home city of Valencia.